To be honest with you, I wasn't planning on writing a blogpost about my recent holiday on a cruise ship with my family. However, after my experience of eating with a severe nut allergy on the Celebrity Equinox cruise ship I felt obliged to write about it. When you mention “cruise ship” to people, they often think it’s a ferry with old people playing cards, and - don't get me wrong - on certain ones that is the case. However, I’ve been fortunate enough to travel on three different cruise lines and they’ve really come a long way. Having the opportunity to travel with Celebrity Cruises around the Caribbean and see lots of different places was incredible and my experience of eating, in particular, was faultless. With over six different restaurants onboard, you’re spoilt for choice when comes to picking where to eat. The food on the Equinox was amazing and they went way above and beyond to make sure all your needs were met to the highest standards. The personal service we received every night from the waiters, wine concierge, and restaurateur was second to none. Every night we ate at one of the restaurants onboard called The Silhouette. It was a set three-course meal where you got to pick your starter, main and dessert. On the first night when I entered the restaurant I told the staff about my severe peanut allergy. Every night after that they made sure to sit us on the same table so that we were always served by the same members of staff who were fully aware of my allergy. Every staff member was very sensitive to my allergy, starting off by serving me separate bread from my family so that it didn't come into contact with nuts. We were introduced to the restaurant manager of The Silhouette, a gentleman called Deveci. He was truly excellent with how he handled my allergy, making an effort every night to make sure I was happy with the food, and really going out of his way to make sure we were all having a good time. Each night he would show me the menu for the next day so that the chef could cook all my food in a separate part of the kitchen. I even got the opportunity to go behind the scenes of what goes on in the kitchen, and was shown where food was prepared if someone had a certain allergy request. For those of us with a severe nut allergy there are not many opportunities to eat desserts at a restaurant where you feel completely safe. I avoid puddings like the plague and rarely ever eat them because it feels like too much of a risk to do so. 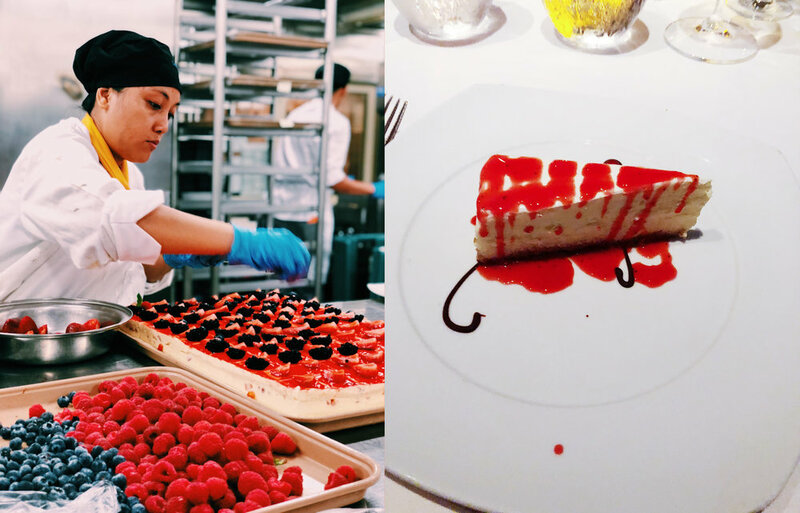 However, eating on the Celebrity Equinox ship was an absolute treat and I had the opportunity to eat desserts every night such as ice cream, apple pie, and cheesecake – all completely nut-free. People without allergies don’t realise the amount of desserts you miss out on in life, so it was amazing to finally indulge. To summarise, I can't thank the staff enough for taking the time to understand my severe allergy and making sure every meal was prepared for me personally so that it didn't come into contact with nuts. If you're reading this Celebrity Cruises, your staff went well above and beyond what was asked of them and it was a true pleasure eating onboard the Equinox ship.